Netflix has finally revealed the series premiere date for the Gilmore Girls new limited series via a teaser video. 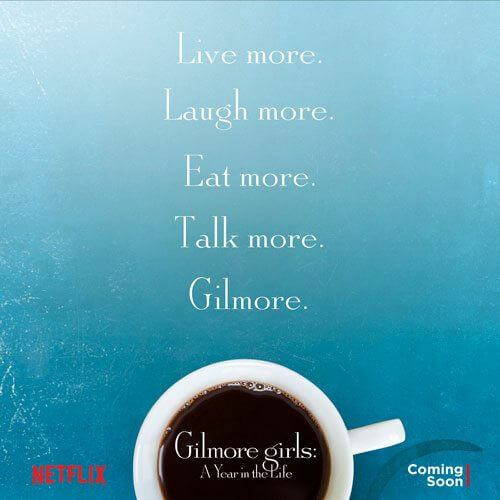 Gilmore Girls: A Year in the Life will premiere on November 25, 2016 and will consist of just four 90 minute episodes. Per the official announcement, the new Gilmore Girls episodes will take place in winter, spring, summer, and fall. The new limited series reunites Lauren Graham (‘Lorelai’) and Alexis Bledel (‘Rory’) – featured in the announcement video – with Scott Patterson (‘Luke’), Kelly Bishop (‘Emily’), Milo Ventimiglia (‘Jess’), Matt Czuchry (‘Logan’), Sean Gunn (‘Kirk’), Yanic Truesdale (‘Michel’), and Melissa McCarthy (‘Sookie’). Series creator Amy Sherman-Palladino executive produces, writes, and directs the four-episode revival with Daniel Palladino.